The Pro Converter AIO RX is the latest innovation of Magewell. It converts live NDI streams into SDI or HDMI outputs for connection to devices such as monitors and projectors at resolutions up to 1080p. It can also be used to integrate legacy devices as switchers into NDI-enabled production workflows. In addition, it can be combined with an NDI encoder to provide long-distance transport of audio, video and power (PoE) over a IP network cable. It features DHCP-based automatic network configuration, while a browser-based interface provides access to status and advanced features. Two on-device buttons allow users to select source content and match the output format, so they can operate without a computer. According to the press release, “one is for choosing between all NDI streams available on the network, and a second for picking a preset output resolution and frame rate”. It will be available during the Q2. The FPGA-based NDI decoding capabilities have also been added to the Pro Convert Plus NDI encoders family through a free firmware upgrade. 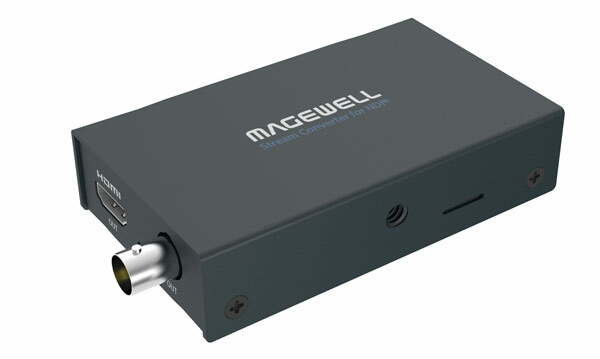 The update, along with the new devices of Magewell, will debut in the NAB Show (April 8-11, Las Vegas).